Can we just talk about how wrong this statement is for a minute? First, it’s not biblical … I mean Google will try to direct you to 1 Corinthians 10:13 to try at justify that erroneous statement. Well, let’s just look at that verse. “No temptation has overtaken you except such as is common to man; but God is faithful, who will not allow you to be tempted beyond what you are able, but with the temptation will also make the way of escape, that you may be able to bear it.” We don’t know what we are capable of bearing but what we do know is that we will be tempted but it will not overtake us. We will be provided a way of escape so that we may bear that which we are to go through. Look at 2 Corinthians 1:8-10 … Paul, a faithful minister of the Gospel, endured great suffering, “We think you ought to know, dear brothers and sisters, about the trouble we went through in the province of Asia. We were crushed and overwhelmed beyond our ability to endure, and we thought we would never live through it. In fact, we expected to die. But as a result, we stopped relying on ourselves and learned to rely only on God, who raises the dead. And he did rescue us from mortal danger, and he will rescue us again. We have placed our confidence in him, and he will continue to rescue us.” If they hadn’t experienced such great suffering would they have learned to rely only on God? Would they know that He is the God who can literally break prison chains and set His people free for His glory? Would they know that the very Gospel that they were risking their lives for was worth it because it was real in the way the Lord had manifested Himself in their lives through their suffering? The last few weeks the idea of transition has been heavy of my heart. I have thought about friends and loved ones transitioning from this earthly life to their eternal life as well as those who are left to find their new norm without this precious loved one present. I have thought about the upcoming election and the transition that will occur no matter who is in leadership. I have thought about transitions that are imposed upon us when we do not want them whether that is due to a health crisis, a job loss or the end of a relationship. And then there are transitions that come about for great reasons, for example: a new baby is born into the family, a new campus for your church or a new job. For me, it is all three except the new baby isn’t due until November! (My sister and brother in law … not me. LOL) This Summer, I have started to see several transitions in my life come full circle and it is something that can only be of God! 8 years ago this month, all hell started breaking loose at the church my dad was pastoring. Our family had been there for 6 years and seen some wonderful years there. But selfishness overruled integrity and our family left as my father was not going to be a part of some ugly church split. We had seen firsthand what that does to a church and never desired to be a part of something like that no matter how “right” it seemed. Our family has been blessed to enjoy many wonderful friendships with so many from that precious church and I am truly thankful for those years that we were there. The transition from being the “pastor’s daughter” to “just Melody” was hard at 25 years of age. I was hurt over the things that had happened and spent many a Sunday hiding out in the balcony of a local church weeping. I was finished with ministry. If this was how the church treated their leaders then I wanted nothing to do with it, however, it was in that balcony that the Lord began to work on my heart. He restored what I thought had been stolen and gave me a renewed passion for serving Him. 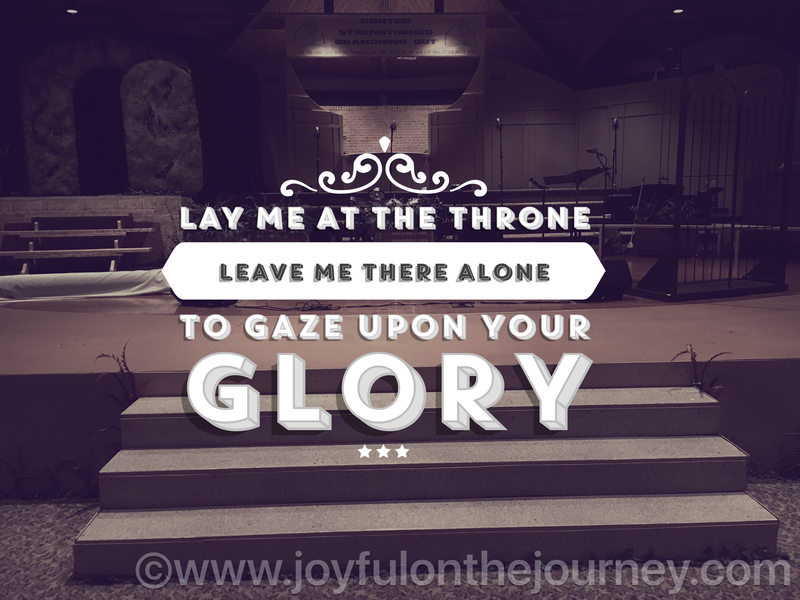 I was led to another church to begin my time of serving Him as “just Melody” and joyfully served Him for 5 years in that church. I forged some lifelong friendships there and was content to stay put for the rest of my life. However, the Lord started working on my heart in March of 2014 that He was calling me away from my ministry. I had gone from being “just Melody” to “Melody, the soloist, the praise team member, the choir member” and I found such peace in that identity but the Lord wanted me to find my identity in Him alone. So I took some time off and stepped back from all my singing responsibilities at that church. I thought that was it but the Lord wasn’t finished. He started leading me away from that church all together and broke my heart. Being a PK (pastor’s kid), it is not in my nature to church hop. You find a church, you join, you serve and you die there, unless God calls your father to pastor elsewhere. 🙂 I fought Him on this one but I finally relented and then made my own plans for what my next church would look like. I know He laughed at that. The next church was to be medium to small in size. No more large to “mega” size churches for me. At the persistence of some very good friends I visited a very large local church on my first Sunday to visit other churches. This was the same church that I had healed in 5 and half years before but I had no intention of liking this church. I didn’t want to be in a big church. But God had a different plan for me that day. It was the only church I ever visited and I joined a month later. I love this church. I love my pastor. I love the people here. But it’s been weird because it’s my home yet not. At my apartment complex, I have started to get to know quite a few people who live near me. It’s funny how daily walks with an adorable puppy and seeing the same people at the pool every few days can really tear down social walls. Their stories have shocked and saddened me while spurring me on to pray even more for those around me. At times, I have questioned why I even live in this complex as I do not fit in with anyone here yet at the same time I fully recognize that this is a mission field for me. But it can be so hard being the only one here or feeling like you are the only here … and then I found out my church is starting a second campus 2.9 miles from my home! Help is coming. I don’t have to do this on my own anymore. Our new campus starts in 3 weeks and I can’t wait! I fully recognize that the Lord has placed me here to serve within my own community and I am in awe of this fact. But the Lord didn’t stop there, I now have a new position within my current place of employment. I am now working 9 minutes from home vs. 19.8 miles from home! The Lord has opened up a door for me to live, work, serve and worship within my own community. Something I haven’t done since my family lived next door to the church my dad pastored 14 years ago! Not only that but my new “boss” was my 4th grade teacher in Lenoir City, TN. My family lived there from 1991-1994 because that’s God called my dad for his first pastorate. This dear woman left an indelible mark on my life. The Fall that I had started her class I had just asked Christ into my heart a few weeks before. I knew she was a Christian by her words and her actions. To have come full circle 23 years later can only be of God. I am so thankful to be under her leadership once again. Oh and in case you were wondering … I gave my life to Christ on either August 2 or 3 of 1993. The best decision I have ever made and a lifelong transition of surrender.